The elegant design of this circa 1900 cast iron rim lock set, with its delightful "C-20" motif, commemorates the beginning of the 20th century. 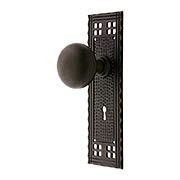 This historic reproduction features glossy black porcelain knobs, as well as a cast iron rosette, keyhole and skeleton keys. The case and matching trim are solid cast iron available in two vintage finishes. Heavy-duty interior parts ensure smooth operation and lasting performance. In addition to the key-operated dead bolt, there is a handy privacy lock (sliding tab on bottom of case). Easily reversible for right or left handed doors. The elegant design of this circa 1900 cast iron rim lock set, with its delightful "C-20" motif, commemorates the beginning of the 20th century. 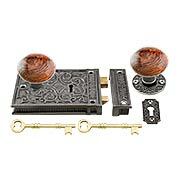 This historic reproduction features authentic brown swirl porcelain knobs, as well as a cast iron rosette, keyhole and skeleton keys. The case and matching trim are solid cast iron available in two vintage finishes. Heavy-duty interior parts ensure smooth operation and lasting performance. In addition to the key-operated dead bolt, there is a handy privacy lock (sliding tab on bottom of case). Easily reversible for right or left handed doors. The elegant design of this circa 1900 cast iron rim lock set, with its delightful "C-20" motif, commemorates the beginning of the 20th century. This historic reproduction features gleaming white porcelain knobs, as well as a cast iron rosette, keyhole and skeleton keys. The case and matching trim are solid cast iron available in two vintage finishes. Heavy-duty interior parts ensure smooth operation and lasting performance. In addition to the key-operated dead bolt, there is a handy privacy lock (sliding tab on bottom of case). Easily reversible for right or left handed doors. Exquisite in every detail, this complete Victorian rim lock set will please the most discerning restorer. Dating from the 1870s, the ornate design is carefully recreated in cast iron available in two vintage finishes. 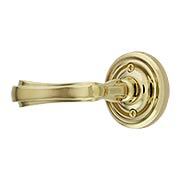 As functional as it is beautiful, the set features brown swirl porcelain knobs, mostly brass interior parts and a key-operated deadbolt. It also includes a rosette, keyhole cover and two skeleton keys. Easily reversible for right or left handed doors. Exquisite in every detail, this complete Victorian rim lock set will please the most discerning restorer. Dating from the 1870s, the ornate design is carefully recreated in cast iron available in two vintage finishes. As functional as it is beautiful, the set features gleaming white porcelain knobs, mostly brass interior parts and a key-operated deadbolt. It also includes a rosette, keyhole cover and two skeleton keys. Easily reversible for right or left handed doors. Capture the true spirit of Craftsman design with our Arts and Crafts Long-Plate Entry Door Set. Rustic and artist, the distinctive window-pane pattern, originally known as Bastille, was designed by Pacific Hardware of Los Angeles around 1912. These vintage-style door sets are enhanced with high-tech mechanics, resulting in silky smooth, trouble-free operation unlike anything you've ever experienced. 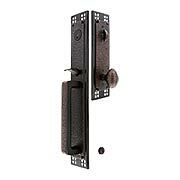 Created expressly for modern, pre-drilled doors, installation is quick and easy for professionals or home owners alike. 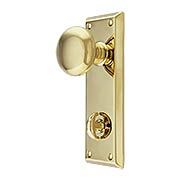 Made of forged solid brass this entry door set will last for years to come. Spare, yet elegant, the Quincy Thumb-Turn Privacy Door Set with Astoria Crystal Glass Knobs exudes early 20th-century style. Whether your style is Victorian, Craftsman, or Mid-Century modern, this classic design will fit right in. 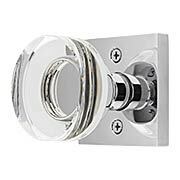 Heavy-duty spring assisted knobs provide incredibly smooth turning action, giving you vintage style without the "rattle". Finely crafted from solid forged brass, this set guarantees you a lifetime of beauty and superior performance. Clear octagonal knobs lend a sparkling accent to this tailored and understated Quincy Thumb-Turn Set with Old-Town Crystal Glass Knobs. Whether your style is Victorian, Craftsman, or Mid-Century modern, this classic design will fit right in. Heavy-duty spring assisted knobs provide incredibly smooth turning action, giving you vintage style without the "rattle". Finely crafted from solid forged brass, this set guarantees you a lifetime of beauty and superior performance. 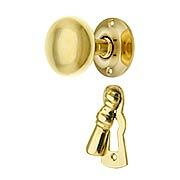 Tailored and understated, our classic Quincy Thumb-Turn Privacy Door Set with Providence Knobs goes with everything. Whether your style is Victorian, Craftsman, or Mid-Century modern, these spare, beveled plates and simple round knobs will fit right in. 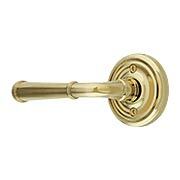 Heavy-duty spring assisted knobs provide incredibly smooth turning action, giving you vintage style without the "rattle". Finely crafted from solid forged brass, this set guarantees you a lifetime of beauty and superior performance. Sleek and simple, the Modern Thumb-Turn Privacy Door Set with Hercules Levers is an eye-catching addition to any contemporary home. Heavy-duty spring assisted levers provide incredibly smooth turning action, giving you bold style without the "rattle". Finely crafted from solid forged brass, this set guarantees you a lifetime of beauty and superior performance. Sleek and simple, the Modern Thumb-Turn Privacy Door Set with Round Knobs is an eye-catching addition to any contemporary home. 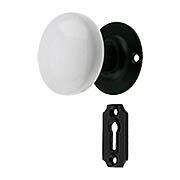 Heavy-duty spring assisted knobs provide incredibly smooth turning action, giving you bold style without the "rattle". Finely crafted from solid forged brass, this set guarantees you a lifetime of beauty and superior performance. The pairing of jet black porcelain knobs and small iron rosettes makes an understated, yet powerful period statement. This typical mid-Victorian combination works with everything, from a Greek Revival town house to a simple country farmhouse. A reproduction mortise lock with a solid brass face plate and interior components completes the vintage look. 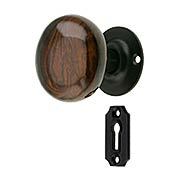 The swirling glaze of these Bennington style knobs recalls the richly grained veneers of fine mahogany antiques. Paired with petite iron rosettes in a lacquered or black powder coated finish, they work with everything, from a Greek Revival town house to a simple country farmhouse. A reproduction mortise lock with a solid brass face plate and interior components completes the vintage look. 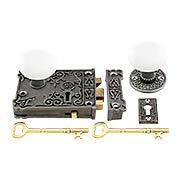 This Federal style mortise lock set is the ideal choice for your early American or colonial revival style home. Small round knobs and rosettes are paired with a wonderful "tassel" keyhole cover, for an authentic period effect. Made entirely of solid, unlacquered brass, which may be kept polished or allowed to develop a natural antique patina. A reproduction mortise lock with a solid brass face plate and interior components completes the vintage look. 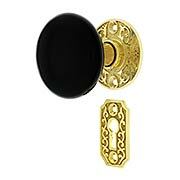 This elegant Victorian rosette is the perfect companion to our stately, jet black porcelain door knobs. 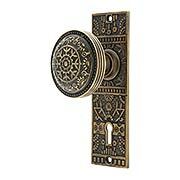 The delicate fleur-de-lis design is reproduced in cast brass and complimented by an ornate keyhole cover. A reproduction mortise lock with a solid brass face plate and interior components completes the vintage look. Capture the true spirit of Craftsman design with our rugged and artistic mortise lock set. The distinctive window-pane pattern, originally known as Bastile, was designed by Pacific Hardware of Los Angeles around 1912. Made of durable cast brass with a velvety bronze finish, our reproduction captures the rough, hand-hammered look of the originals. 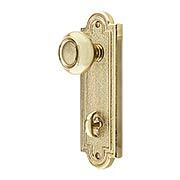 An authentic mortise lock with a solid brass face plate and interior components completes the vintage look. This Windsor pattern mortise lock set is one of our finest Victorian-era reproductions. Introduced by Reading Hardware around 1885, the whimsical Aesthetic design is just as fresh and lovely today. Even the lock face and strike are beautifully decorated! 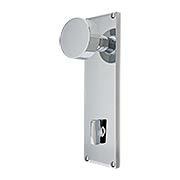 The heavy-duty lock features a solid brass face plate, interior components and skeleton keys. Precisely cast in solid brass, the set comes in our own Antique-by-Hand—a living antique finish that ages gracefully over time. Two skeleton keys complete the set. 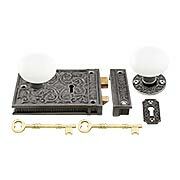 This Windsor pattern mortise lock set is one of our finest Victorian era reproductions. Introduced by Reading Hardware around 1885, the whimsical Aesthetic design is just as fresh and lovely today. Even the lock face and strike are beautifully decorated! 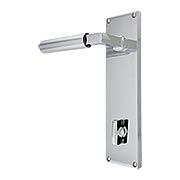 The heavy-duty lock features a solid brass face plate, interior components and skeleton keys. Precisely cast in solid brass and left un-lacquered, this set will develop an authentic antique patina over time. 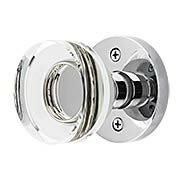 Our Disc Rosette Door Set with Disc Crystal-Glass Knobs brings sleek style to any decor. From the sparkling clarity of the knobs to its crisp rosettes, you'll appreciate the exceptional quality of this contemporary design. 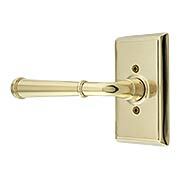 Finely crafted from solid brass, it comes in a host of popular finish choices. 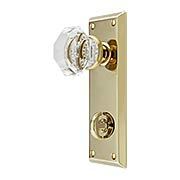 Our Square Rosette Door Set with Disc Crystal-Glass Knobs brings sleek style to any decor. From the sparkling clarity of the knobs to its crisp rosettes, you'll appreciate the exceptional quality of this contemporary design. 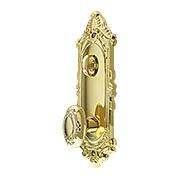 Finely crafted from solid brass, it comes in a host of popular finish choices. Our Square Rosette Door Set with Square Crystal-Glass Knobs brings sleek, style to any decor. From the sparkling clarity of the knobs to its crisp rosettes, you'll appreciate the exceptional quality of this contemporary design. Finely crafted from solid brass, it comes in a host of popular finish choices. Tasteful and timeless, our Classic Rosette Door Set with Merrimack Levers offers enduring style and quality. 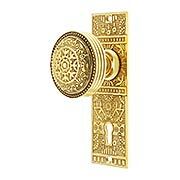 With classic round escutcheons and a host of traditional finishes, it complements almost any style of decor. Heavy-duty spring assisted levers simplify installation, and ensure ultra-smooth operation. Finely crafted from solid forged brass, this lovely door set will provide you a lifetime of beauty and superior performance. Tasteful and timeless, our Classic Rosette Door Set with Wembley Levers offers enduring style and quality. 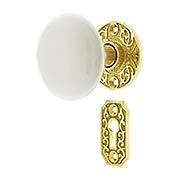 With classic round escutcheons and a host of traditional finishes, they complement any style of decor. Heavy-duty spring assisted levers simplify installation, and ensure ultra-smooth operation. Finely crafted from solid forged brass, this lovely door set will provide you a lifetime of beauty and superior performance. Tasteful and timeless, our Rectangular Rosette Door Set with Merrimack Levers offers enduring style and quality. 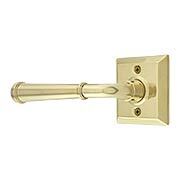 With classic square escutcheons and a host of traditional finishes, they complement any style of decor. Heavy-duty spring assisted levers simplify installation, and ensure ultra-smooth operation. Finely crafted from solid forged brass, this lovely door set will provide you a lifetime of beauty and superior performance. Colonial, Craftsman, Mid-Century Modern - the Quincy Rosette Door Set with Merrimack Levers has it all. With finish options ranging from polished chrome to oil-rubbed bronze, you can tailor the look to every room in your house. Finely forged from solid brass and updated with spring-assisted mechanics, this straight-forward design will give you a lifetime of beauty and quality performance. Designed in the Louis XVI style by Russell & Erwin around 1899, the Belmont Door Set with Matching Knobs is one of our most versatile designs. The reserved back plates, embellished with nothing more than a simple double border, work with everything, from authentic Arts & Crafts to the most formal French classical. Originally cast in bronze, this antique recreation is finely forged from solid brass and enhanced with modern, spring-assisted mechanics. 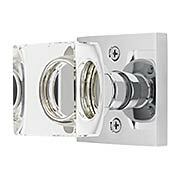 Simple installation and ultra-smooth turning action make this set an excellent choice for any renovation or new construction. 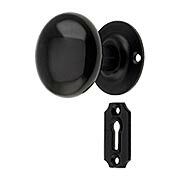 Lavish beauty on your doors with our Largo Design Door Set with Matching Knob and Thumb Turn. Inspired by Yale & Town's "Largo" pattern of 1910, the back plates are beautifully detailed with classical motifs. Easy and quick installation makes restoration or new construction efficient and exact for professional builders or home owners alike. Made of superior quality solid-brass forgings.